Avenue 74 Art Gallery hosts blockbuster art show Avenue 74- A Miami Art Gallery owner Adam Brand (center in black t-shirt) and some of the 65 exhibiting artists coordinated by Adam and his team at Frames USA for the show. 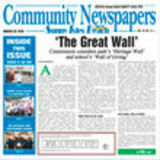 and white background decorated with protest posters and stark images of which she is a part. “It’s not just about me,” said photographer and painter Fleischmann. “I use the body as canvas and the subject becomes part of the environment and the art.” New York City and Miami based Artist Chris Riggs displayed a portion of his 25 foot long by 20 foot high Graffiti Pyramid composed of 36 separate pieces. Riggs says he thought about doing it for years and when he finally set to work it took him about a week to complete. “My main message is about peace and love,” said Riggs. “There is so much messed up in the world right now. If you turn on the TV or go on the internet it’s all negative. I want to put positive images and colors out there.” The positivity was palpable at the Avenue 74 show where excited artists joined by family and friends snapped photos, swayed to the live music, and enjoyed dishes served up by the neon lit food trucks nearby. “This is our biggest show ever in the five months we’ve been open,” said Brand the night of the event. “We had over 500 people tonight. 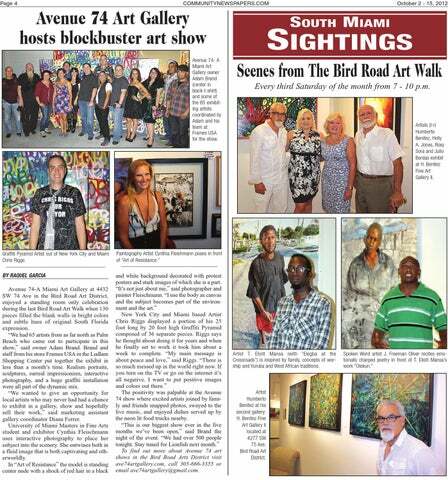 Stay tuned for Lionfish next month.” To find out more about Avenue 74 art shows in the Bird Road Arts District visit ave74artgallery.com, call 305-666-3355 or email ave74artgallery@gmail.com. SIGHTINGS Scenes from The Bird Road Art Walk Every third Saturday of the month from 7 - 10 p.m.
Artists (l-r) Humberto Benitez, Holly A. Jones, Roxy Sora and Julio Bordas exhibit at H. Benitez Fine Art Gallery II. Artist T. Eliott Mansa (with “Elegba at the Crossroads”) is inspired by family, concepts of worship and Yuruba and West African traditions. Artist Humberto Benitez at his second gallery: H. Benitez Fine Art Gallery II located at 4277 SW 75 Ave, Bird Road Art District.